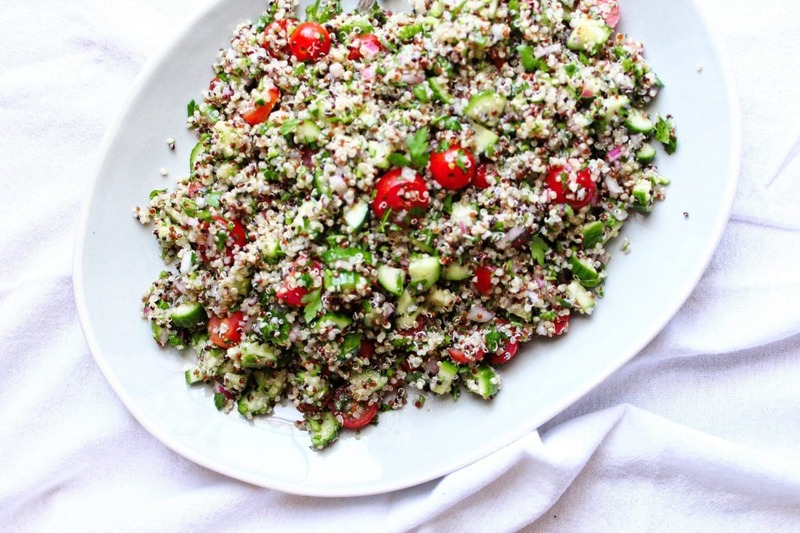 Jo Eats | Quinoa Tabbouleh - delicious, healthy, and fast! Real talk – I have been very busy with life and obviously not with blog. WE ARE MOVING IN ELEVEN DAYS. Sooooo…yeah that pretty much covers it. But here’s the thing – I have missed you, dear reader/endless internet void. So bear with me as we transition to *gasp* the burbs (more on that later). I will try to post more consistently, but in the moments that I fail, please know I’m dying to share whatever new, delicious thing I’ve been tweaking just for you. I am here, possibly buried underneath a mountain of packing tape and crumpled newspaper, but still here. And when I occasionally resurface, I’m usually hungry. Enter pizza. But as much as I’d like to maintain a solid menu of that, and fried chicken, and ice cream sandwiches this summer, sometimes you just need a bowl of quick and healthy grub so you can get back to packing all of the things you’ve acquired over the previous 34 years (so. many. bobby pins). 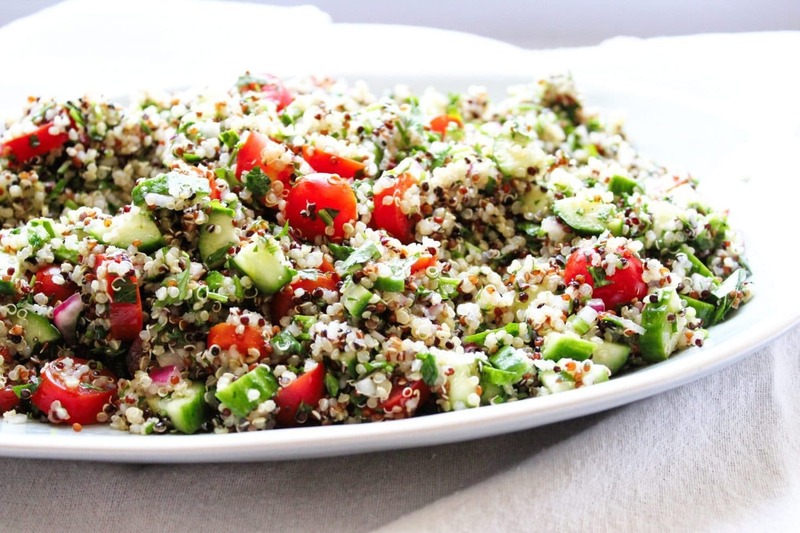 Quinoa tabbouleh is the answer. It’s fast, good for you, and totally enjoyable to eat. Also it makes a perfect side dish for that fried chicken I mentioned earlier – because balance ya know? This is obviously not authentic or traditional, but it does taste awesome and just gets better as it sits. There is a lot of parsley in here – like more than you would probably ever think to use in one dish. Trust though – I would not steer you wrong. Cook quinoa any way you’d like. I boil mine like pasta in a large pot of salted water for about 12 minutes. Then I drain it and let it cool. It can be warm, but not steamy hot. 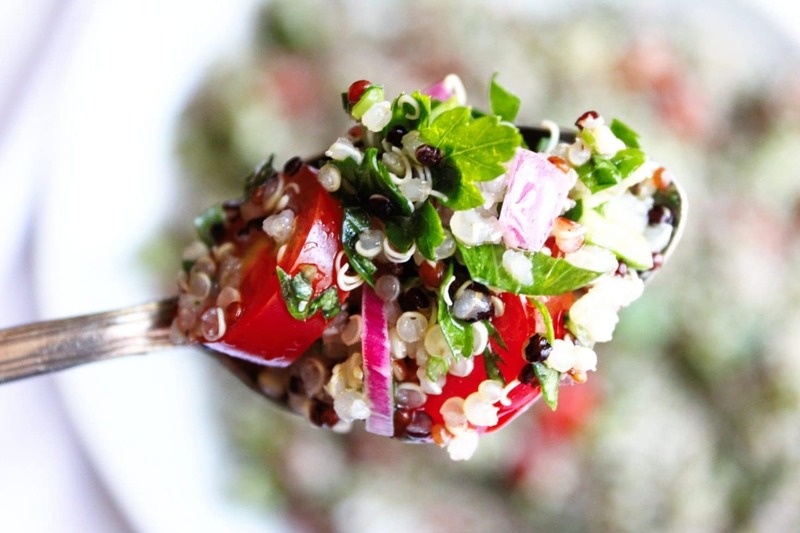 While the quinoa cooks you can dice your veggies and chop your parsley. When you’re ready to assemble start by adding the red onion, red wine vinegar and salt to a large bowl. Stir to dissolve the salt and let it sit for five minutes. This will take some of the sting out of the red onion. 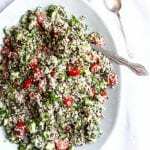 Then add the cucumber, tomatoes, quinoa, parsley, black pepper, and olive oil. Stir to combine thoroughly and taste for seasoning. You can eat this right away, but it gets way better as it sits. I usually chill mine for at least an hour before serving. Cold food naturally tastes a little blander, so if you want to eat it straight from the fridge I’d suggest tasting again and adjusting the seasoning if necessary.